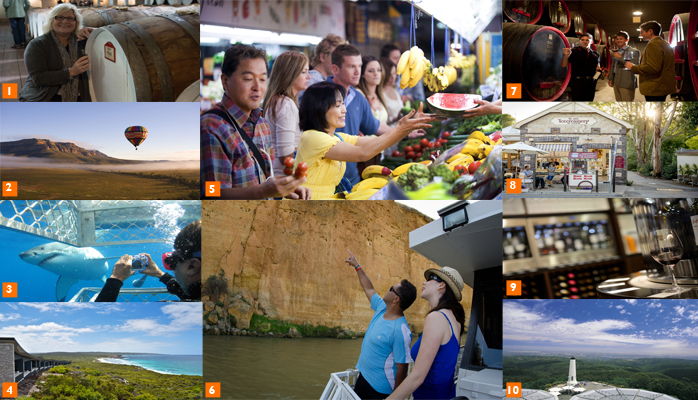 South Australian operators will create experiences built around each event’s requirements, with a great selection of itineraries available through the Adelaide Convention Bureau and the South Australian Tourism Commission. Here are ten South Australian experiences as examples. Visit a famous and historic winery in the heart of the Barossa, where the winemaker escorts guests to a private barrel hall to locate – and taste – a glass of fortified wine from the year of their birth. A personalised bottle of birth wine is available as a memento. Experience this ancient landscape, including the breathtaking Wilpena Pound, by plane, hot air balloon or four-wheel drive. Participants can explore from a base of luxury eco-villas found in the heart of the Flinders Ranges. Under expert guidance, cage dive with Great White sharks in Port Lincoln – the only place in Australia where this is possible! Another exciting option is to swim with energetic Blue Fin Tuna and participants can even feed them their lunch! On the beautiful wilderness of Kangaroo Island get up close and personal with wildlife, including seals, penguins, koalas and kangaroos, visitors can embark on a food safari discovering fresh Island produce. To stay, visitors may choose a six-star luxury lodge or the Island’s newly refurbished hotel… both facing the ocean. Guided by a local food expert, a sensory and interactive gourmet walking tour through the Adelaide Central Market. Interact with stallholders, taste foods and experience the exciting buzz of the largest fresh food market in the Southern Hemisphere. At nearby Mannum on Australia’s famous Murray River climb aboard a luxury houseboat. Hosted by the skipper and private chef, and enjoy breathtaking sights, fine food and wine and water activities such as jet skiing and fishing. Dining may include a gourmet Aussie BBQ under a private canopy on the banks of the river. 7) GRANGE TASTING AT THE HOME OF PENFOLDS! Just 15 minutes from the city, Penfolds Magill Estate is the original home of Australia’s most prized wine, the Grange. Guests are greeted by the winemarker and taken into a private cellar for a structured tasting experience of Grange and other iconic wines and an insight into the history of this famous wine. An experience not to be missed! One of the Adelaide Hills’ most famous towns, Hahndorf is Australia’s oldest surviving German settlement. Old and new combine to present you a brilliant blend of activities. There is still a strong German flavour in Hahndorf, most evident in the smallgoods outlets and German bakeries that line the bustling main street. At the iconic National Wine Centre of Australia visit ‘Wined’ tasting room with Australia’s largest selection of premium wine by the glass, all dispensed by cutting edge automated Enomatic machines. Add to this there is the centre’s wine discovery journey where visitors examine the art and history of wine production. Mount Lofty Summit is a “must see” destination for any visitor to South Australia. Each year more than 350, 000 people visit the peak which rises 710 metres above sea level. The summit landing provides breathtaking panoramic views across Adelaide’s city skyline to the coast, with visibility extending as far as Kangaroo Island on clear days.